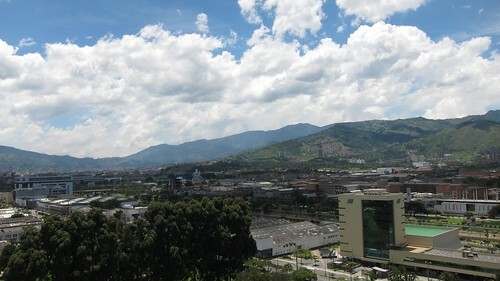 View of Medellin from my bedroom window. The funny thing about dreams is that once you achieve one, you become a heck of a lot more self-assured about what you can do in life. I'm hardly an impetuous person, so it took me five and a half years of saving to embark on my dream trip around the world. And as those travels became fully realized, it was only natural to take stock of the new me, and come up with a new dream to pursue. I want to make enough money from blogging to live and work anywhere in the world. Four months ago, my parent's sold their house in Virginia, and I knew it was my opportunity to take a leap of faith and see if Dream 2.0 was feasible. I moved back to Medellin, Colombia in an effort to continue building a location independent business from a foreign city I already knew and loved. While I've been tracking my monthly online income for four years now, I really had no way to predict what would happen going forward. …would I have to return home in a few months, tail between my legs, with my meager savings once again depleted? Thankfully, I can report that my income has risen to new heights since leaving home. To paraphrase Paul Coehlo from The Alchemist, when you really want something, the universe conspires to help you achieve it. And the lifestyle I imagined for myself those 11 months living and working in my parent's spare bedroom, including location independence, is now my day-to-day reality in Medellin. I've settled into a new, 20th floor apartment with mountain views. Wilson, one of my Colombian roommates, enjoys cooking therefore I'm treated to homemade Colombian meals on a regular basis. He has a genial old Labrador named Tobias who lays around all day, ensuring my blood pressure never gets too high. My other roommate, Jorge, is friendly though hardly ever around. It's a 10-minute walk to the gym, which I try and hit three times a week. And it's a 10-minute walk in the opposite direction to the dance studio where I take private salsa lessons. I've made a few good friends since returning, developed an appreciation for babies, and had more than a few exciting dates. I've continued to explore Colombia, visiting big cities such as Cali, and small pueblos like Guatape. My Spanish is better than ever, and if I actually dedicated time to studying it every day, fluency wouldn't be far off. However in spite of all the positives that come with this new lifestyle of mine, I've had a nagging feeling that I could be managing my time better. I have a half dozen different projects I want to pursue, yet I've not started down the path to developing any of them since leaving home. While I'm making enough to keep the same course in Colombia, or any number of other countries such as Thailand or Argentina, I need to work a little harder if I want to continue to see more of this world, and live in places, the thought of which, light up my eyes: Rio de Janiero…Venice…Paris…New York City. That’s wonderful Dave, congratulations! I’ve loved following your time in Columbia and am so happy things are going so well. You’re proof positive that if you want something bad enough, you can make it happen. Give it time, you’ll find the balance you’re looking for. It couldn’t happen to a nicer person. Thanks for the wise reminder Ayngelina! Gracias Jason — it’s amazing how a whole new subculture has developed over the last 5-10 years thanks to the internet and social networking. Great to see that you are living your dream! I am trying to get stuff together and make my second attempt soon. Hopefully very soon! See you around the world someday amigo. Hey Hansen, looking forward to sharing a beer some day. I’ll be around South America for awhile I think. Living the dream, Dave. Living the dream. Hey Charlie, it just keeps getting better! That is one of my favorite quotes from the Alchemist as well. I’m feeling the effects of “the universe” too. Awesome post Dave, it puts a smile on my face. Keep living the dream! Wow! I read your blog and follow you on Twitter, but I had no idea you had such an inspiring story! It’s funny but my parents selling their house was also an impetus for me to follow a dream of mine – living for some months in France. I studied French literature at university, and all of my fellow French lit concentrators participated in the study abroad program; I was unable to go (was also pre-med and somehow I couldn’t imagine studying biochemistry in French). After uni I moved back to my hometown and was living in my parents’ house. My life was pretty comfy, and I thought my time for study abroad – to actually live in Paris – had passed. However, when my parents moved, I decided to go for it. I took a gamble finding a place to live online and buying a ticket all within a very short time. I was a bit scared to move to a new country with only a vague idea of what I was going to do, but my experience there turned out to be exactly as I had pictured – better actually! Unfortunately, the older I get, the more risk-averse I become. It happens at the present moment I am at one of those jumping points in life, just like the one you described;I therefore found your blog post very timely. I too am a big fan of The Alchemist and its amazing message and love to see real-life examples. Gracias por contarnos tu historia! La comparti con mi familia y con mis amigos. Bonjour Anis! Thanks for following my adventures on the blog and Twitter…and sharing your experiences here! I hope when you decide which fork to take, you won’t let fear be a determining factor. Hey Dave! I just wandered over to Blog to Travel and saw your September earnings – wow! Nicely done! My September wasn’t nearly as good as yours but, like you it sounds, October is a monster. There’s an amazing sense of satisfaction that comes with finally earning a reliable income from this internet gig. Suddenly it doesn’t feel so much like playing around online. Good luck with your new projects! Like you, I always have several things on the go but I’m making some progress as well. Dream 2.0 – Location Independence | Go Backpacking	and your internet site was in the very first few websites, you must be doing something suitable for google to like your posts so much. Have you ever considered blogging for money? I actually remember reading your story before, and responding! I’m not sure what happened, but thank you for taking the time to share again. I’ve found living abroad better than I imagined it as well. At the end of each 6-month stint in Colombia, I really don’t want to leave! Wow, very inspiring and I love the alchemist book, it’s awesome especially because it gives you the message in a different way. To add, I have a similar goal, but maybe not the desire to live somewhere else all the time since I like my home a lot.